Dr. Cook is the owner of Lowcountry Veterinary Surgery in Charleston SC and is a board certified surgeon. With the his surgical skills we are now able to provide advanced surgical procedures here at River Oaks Animal Hospital. 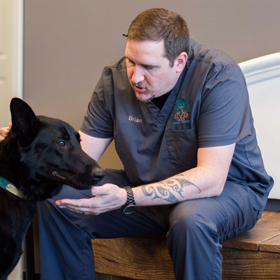 He has done several advanced orthopedic and soft tissue surgeries for us including TPLO, luxating patella stabilizations, and salivary gland resection. We are very grateful to have him available for our clients. Brian has been with River Oaks Animal Hospital since August 2014. He started out as our one and only Client Service Specialist but has now become our Front Office Team Leader and Office Manager. This means that he is responsible for ALOT of stuff, primarily keeping Dr. Heather sane! Some of his responsibilities include training new Client Service Specialists, cross training all staff to be able to work the front desk, data management, customer service quality control, conflict management, human resources, and “being awesome”. Brian has a Bachelor’s degree in Philosophy from Coastal Carolina University. “I enjoy seeing our wonderful clients each day, especially the patients that come to us originally as puppies or kittens and are now fully grown,” says Brian. “I also like the close-knit support of all the team. We really are like a work family!” Brian has two pups at home, Whitney and Eva. When he’s not at work he enjoys cooking, hiking, traveling, playing video games, and spending time with his wife and dogs. 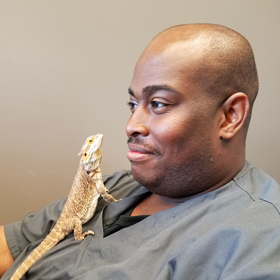 Trevor joined the team at River Oaks Animal Hospital in 2017 to finally give Brian some help. He has an associates degree in Culinary Arts from the International Culinary Institute of Myrtle Beach at Horry-Georgetown Technical College. He made fantastic doggie treats for Halloween! When he’s not at work he enjoys cooking, fishing, traveling, creating music, working with is local church, and spending time with his family and friends. Victoria joined River Oaks Animal Hospital as a HealthCare Nurse in November of 2015. 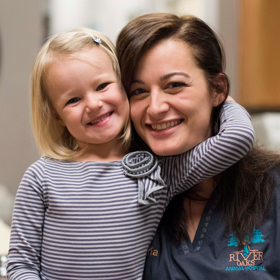 Her responsibilities include assisting during surgery, post operative recovery, triage, dental cleanings, and diagnostic procedures. In 2017, Victoria also took on the role of Inventory Team Leader. This is one of the toughest jobs in the veterinary hospital as she is in charge of making sure we do not run out of inventory and negotiates the best prices for our clients. Her favorite part of the job is building relationships with pets and their parents. Victoria has a Veterinary Assistant certification from Lancaster Career and Technology Center. Victoria has a passion for herbs and has single handedly kept many people in the Carolina Forest are from getting the flu with her special Elderberry Syrup. She has two kitties; Angelus and Twilight Sparkle. As you may have guessed by the second kitty’s name, she also has a daughter Jordyn Rose. Victoria has become an indispensable team member at River Oaks Animal Hospital. Melissa joined our team in 2016 and has been a great asset. Not only does she have superior nursing skills but she is also always entertaining. You are never quite sure what she is going to say or do which at times can be a bit frightening. Melissa is not only a HealthCare Nurse but she is also our Laboratory Team Leader and helps with marketing endeavors. Most of our social media content is from Melissa. She is very compassionate and a huge patient advocate. When not at work you can usually find her at the dog park or church. Her dog, Mia, is a special girl that almost died as a puppy due to hookworms! But with a little magic from Dr. Heather and tender loving care from Melissa she survived and is one of the best dogs ever! She also has a kitty named Lucy. Lucy is hyperthyroid so Melissa is a great resource to talk to about living with a kitty affected by this disease. Loren joined the team at River Oaks Animal Hospital in May of 2015. She not only is a Veterinary Assistant but also our Boarding and Day Spa Team Leader. 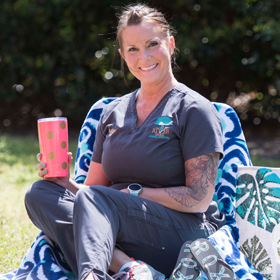 Her responsibilities include ensuring perfect Spa Day Experiences for our pups, assisting during examinations, preparing patients for surgery, and assisting with diagnostic procedures. She enjoys meeting new people and pets, as well as being able to help sick animals feel better. Loren has a Veterinary Assistant certificate from Brookdale College. At home, Loren has two pups, Titan and Sandy. Although she is tiny she is mighty! Her favorite thing to do is to go to car and truck shows and work on her Mustang. She asks off every year for Mustang Week! Our little Loren Bug is one of the sweetest people you will ever meet! Rachel joined the team in 2017. She is affectionately known as the “cat lady” and loves kitties. Her passion is learning everything possible about cats and their care and making vet visits better for them. She absolutely dotes on Smoogie and Ralphie with treats and catnip. Rachel loves therapy laser and has a lot of experience using it so she will be heading up our Therapy Laser Program. Rachel shares her home with two rescue kitties and a ten year old son, Landon, that are her life. 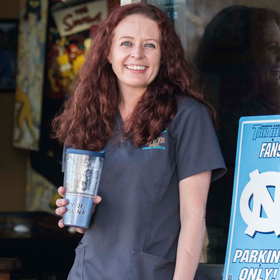 Unfortunately for Dr. Heather, Rachel is an avid UNC basketball fan and will be seen sporting Tarheel Blue during the season. When not busy, you can find her hanging out at the beach and traveling. 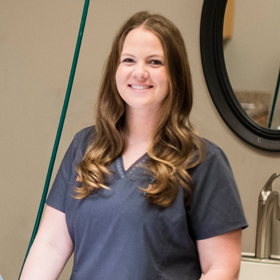 Heather joined the team at River Oaks Animal Hospital in September of 2017. She has been in the veterinary field for 14 years, doing every job from receptionist to nurse. Her favorite part of her job is working with pets and meeting their parents. Heather also moonlights at the Animal Emergency Hospital of the Strand at nights and on the weekends. Heather is enamored with Smoogie and is his personal assistant. At home she has a nine year old, rescue dog named Baby Girl. Amazingly, Heather is also the mother to 3 teenage boys! In her rare free time, you can find her at the beach, soaking up the sun and spending time with her kids. Smoogie can be demanding – particularly when he wants food, water, to be picked up, or attention – but deep down, he’s a great big lover. His unique haircuts and expression may lead some to believe he’s unapproachable, until he approaches you. 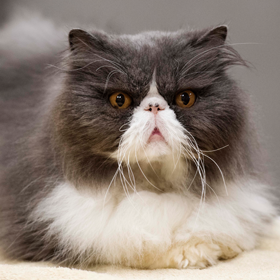 Smoogie is older and has heart disease that is manageable with the right attention and care. When he’s not busy sleeping, Smoogie enjoys playing with cotton swabs, indulging in catnip, and overseeing his minions (aka the ROAH team). Sofia is the original clinic cat at River Oaks Animal Hospital. Her official duties include playing fetch, holding down papers on Dr. Heather’s desk, and looking scornfully at the ROAH team. Sofia has a unique and uncommon disease called Diabetes Insipidus. This is not the same as Diabetes mellitus (elevated glucose, managed by insulin) which makes her a great learning tool. She has an independent spirit, but when she wants attention she turns on the charm. Ralphie is the newest edition to River Oaks Animal Hospital and was actually born here. 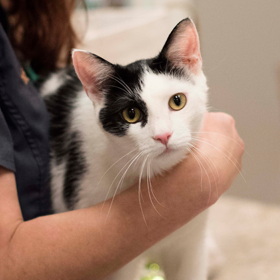 His mother was scheduled to be spayed but it was discovered that she was VERY pregnant and so Dr. Heather decided to take care of her until she delivered. Ralphie is very attached to Sofia and they play all the time. He is also fond of kids and can be found stalking outside of the exam room doors if he hears them. He doesn’t have any official duties because he isn’t quite old enough for the responsibilities. You can usually find him “helping” out in the treatment room with the HealthCare Nurses. Bindi is our resident Bearded Dragon. You can usually find her in her habitat where she calmly observes the activity of the lobby. 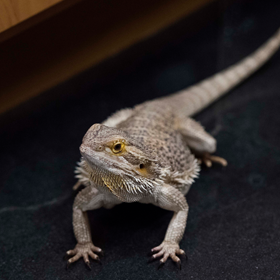 Bindi’s job is to show clients that reptiles make great pets, too- and to eat gourmet salads, crickets and superworms. She loves going outside in the spring to eat fresh dandelions. 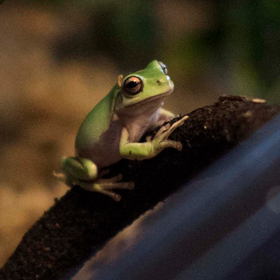 Newman and Kramer are Dumpy Tree Frogs, also known as White’s Tree Frog. They are arboreal frogs, meaning they like to live in the trees. This type of frog actually come from Australia but these two were captive bred so they were not taken from the wild. They are definitely use to room service and not so sure they would appreciate having to hunt for their food instead of ordering in. As the two age they will start to look chubby, this is normal and expected. Why can’t that be normal for us?